MANILA, -- U.S. Marines and sailors from the Bonhomme Richard expeditionary strike group (ESG) are scheduled to take part in a joint exercise with the Armed Forces of the Philippines which is set to start next week. The 33rd iteration of the Philippines amphibious landing exercise (PHIBLEX 33) will take place on multiple locations in Luzon and Palawan between October 4 – 12. According to local media, four US Navy ships already arrived at Subic Bay Freeport. Lewis and Clark-class dry cargo ship USNS Washington Chambers (T-AKE-11), Spearhead-class expeditionary fast transport USNS Millinocket (T-EPF-3), Pathfinder class oceanographic survey ship USNS Bowditch (T-AGS) and submarine tender USS Frank Cable (AS-40) are in port ahead of the exercise. Humanitarian civic assistance efforts, an amphibious landing exercise and live-fire training featuring artillery are on the program for PHIBLEX 33. 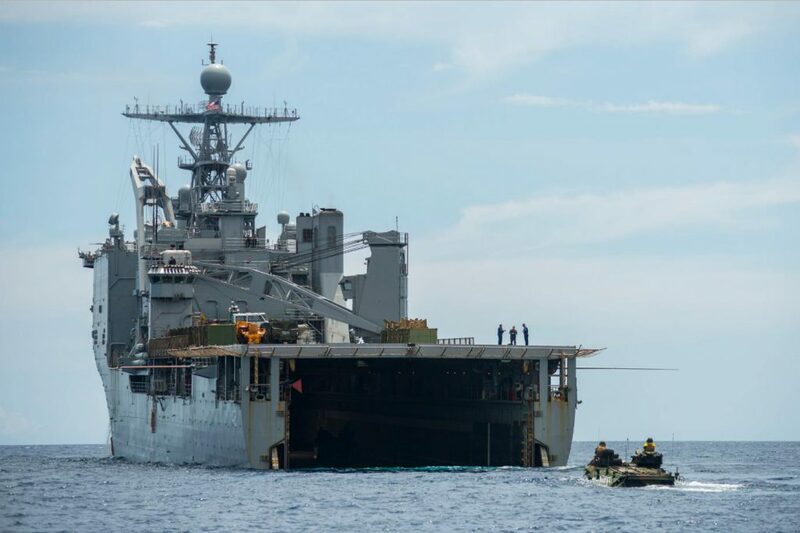 The exercise will include approximately 1,400 U.S. service members based in Okinawa, Japan and 500 Philippine Armed Forces personnel working side-by- side to grow capabilities and better prepare to operate together during a natural disaster or armed conflict. “The opportunity to train and build mutually beneficial capabilities with our Armed Forces of the Philippines partners is essential for sharpening our bilateral amphibious and humanitarian assistance capabilities, both hallmarks of the U.S. Marine Corps” said Brig. Gen. John M. Jansen, Commanding General, 3d Marine Expeditionary Brigade. “Exchanging expertise and cultivating our longstanding security alliance provides a cornerstone for security and stability in the region, and has for decades.” The humanitarian and civic assistance portion of the exercise, beginning in September and concluding 12 October, includes engineering projects to improve local infrastructure and health engagements to exchange medical best practices and supplement the medical needs of Philippine citizens. Field training during the exercise includes small arms and artillery live-fire which will provide the and U.S. Marine units multiple opportunities to maintain and sharpen their skills while enhancing interoperability. Additional U.S. units participating include Amphibious Squadron 11, the 31st Marine Expeditionary Unit and the three ships of Bonhomme Richard Amphibious Ready Group (BHR ARG). The ARG consists of the USS BHR (LHD-6), the USS Green Bay (LPD-20), and the USS Germantown (LSD-48). Philippine units include the 3d Marine Brigade and the Philippine Navy’s new strategic sealift vessel, the BRP Tarlac. The USS Germantown (LSD 42) during annual bilateral training exercise conducted with the Armed Forces of the Philippines PHIBLEX 15 in Palawan, Philippines.